A Chicago police officer has resigned a month after a video of him standing by while an elderly man harassed a Puerto Rican woman for her un-American T-shirt went viral. 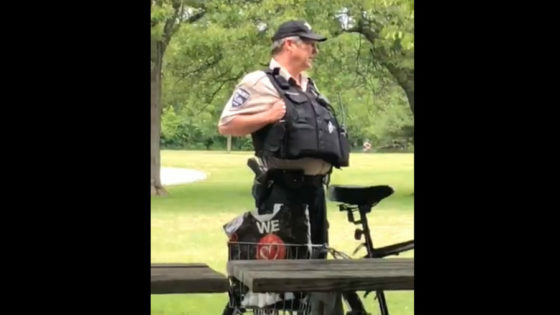 Officer Patrick Connor of the Forest Preserves of Cook County Police Department resigned late Wednesday, and the police department say they are continuing to investigate the incident. In a video filmed last month that recently went viral, Connor can be seen standing by while an irate man harasses Mia Irizarry, who is dressed in a tank top with the Puerto Rican flag on it. Woman wears a Puerto Rico shirt. A man confronts her for wearing it, repeatedly approaches her within a couple feet, and questions her citizenship. Seemingly unaware that Puerto Rico is in fact a US territory, the man proceeds to unload on Irizarry, calling her un-American and questioning her citizenship. Irizarry called for help from Officer Connor, who declined to intervene, and instead milled around in the background. Eventually, other officers turned up and arrested the man, who they said was intoxicated. The man, identified as 62-year-old Timothy Trybus, was charged with assault. So, "old dude" harassed a woman for wearing a shirt that said, "Puerto Rico." Eventually, other officers turned up and arrested the man, who they said was intoxicated. The man, identified as 62-year-old Timothy Trybus, was charged with assault. Anybody know if Timothy was wearing a Trump MAGA ball cap? "I would like to know is she an American citizen?" Good question. The answer is she is a "statutory" citizen, not a "constitutional" citizen. Meaning Congress, at any time, can stop giving U.S. citizenship to people born in Puerto Rico. The 14th amendment doesn't apply to Puerto Rico. Puerto Ricans living in Puerto Rico cannot vote for Congress or the President. Well,*I* am unaware that makes them citizens. Irizarry called for help from Officer Connor, who declined to intervene, and instead milled around in the background. And he was wrong.Cops exist to keep the peace,not pick sides in arguments. Meanwhile, the video drew anger on Twitter, and the Governor of Puerto Rico joined the calls for Connor to be fired on Monday. And of course the only reasonable answer to that is "I no speaka de spick. Hiz not my yob,man!" Or as an alternative,"Speak English,MoFo!" Puerto Ricans living in Puerto Rico cannot vote for Congress or the President. Nor could they be drafted back when the draft was in place. If they were living in the US and getting paid to vote Dim by getting free housing,fookd,clothing,and a check each month,they COULD be drafted.